That's lovely, when mine does that means it's time to go redig the trench so it doesn't meander too close. BY the house, but not THROUGH the house? I am so envious ... ! Would love to have a creek. So, by "wet weather creek" you mean it's mostly a dry creek bed? I love creeks too - would love to have one near another house, not this current house. Nice photo! Yikes. Up to the hubcaps in icy water is never good. I think I'd be afraid to go look, too. Fortunately the only redigging we have to do is on the other side of the house--where the dogs (and assorted unseen nocturnal critters) manage to fill up the grey water trench doing a little trenching of their own. No not THROUGH the house, fortunately. But once upon a time there were 40 houses (and a sawmill, and a school, and a general store which is the 100+ year old part of our house) down in this little valley, and our house is the only one still standing. All the others were flooded at some time or other. As far as I know, the creek has never reached the house. But a few years ago we had so much rain that everything was flooding--most of the hayfield was under water. That little creek got about 70 feet wide and was creeping up toward the front yard fence. See all the rocks on the left side of the photo? Those were all washed downstream during the flooding. Changed the whole landscape in front of the house--and even made us a nice little swimming hole, too. That was the time I nearly drowned wading across it holding onto a rope we'd strung from one side to the other (the barn is on the other side of the creekbed). Talk about scary. I like it much better when it's the size in the photo. I would love to have this one flowing all year round. There's just something so pleasant and soothing about looking at and listening to the moving water. Yep, most of the time this is a dry creek bed. 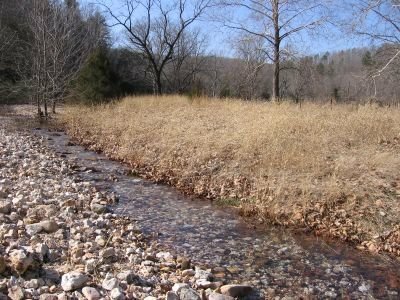 When we get a lot of rain, all of the "runoff" from the hills and from the underground springs begin to flow down the creekbed. There are parts of it where, if it's not flowing much, it will disappear underground and then reappear downstream. The most interesting thing is that often it will have stopped raining by the time the creek starts flowing. Most of the time it only flows for a few days, but there have been a few times where's it has stayed around for a couple of weeks. The positive aspects of having the creek definitely outweighted the negative ones (like always having to wear your rubber boots to get down to the barn). We have a pretty wet weather creek on our new place and I'm not sure how to properly maintain it. Since many trees were cut down during construction it has changed drainage. More and more dirt seems to be disappearing. Any pointers? I would get in touch with your local conservation department. They may be able to offer some suggestions and/or send somebody to come out and take a look at your property. Local County Extension Services can also be very helpful. If you're a farm, you might contact your local USDA office, too.